I first heard of Shoestring Adventures through a friend of mine who introduced me to the founder, Alyx, over lunch in Culver City. I was immediately intrigued. I would consider myself an avid adventurer by the average persons standards, but by the tried and true standards of real adventurers (think Nat Geo), I'm really more of a novice. For example, I would never go diving, canyoning, or climbing without a guide. Shoestring Adventures offers a great solution for backpackers who want the convenience of a guide, are new to the sport, or just want some company to socialize with for the trek. Perks include trip organization, planning every meal, providing permits and a professional photographer to capture some great moments along the way. 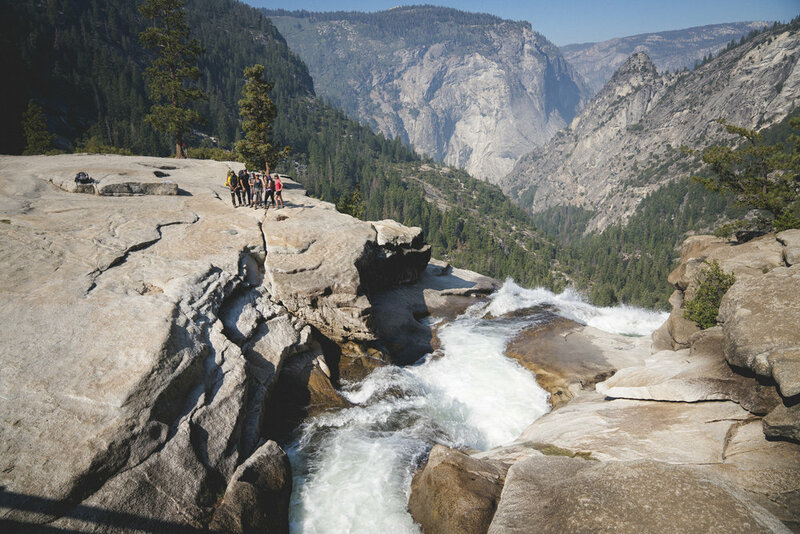 Yosemite is arguably the most famous national parks in California, and Half Dome is on most avid hikers top summits to conquer. I've attempted to summit Half Dome twice before, once canceled due to weather, another canceled due to catching the flu. I chose to go on this adventure with Shoestring hoping for a better outcome. Third times a charm, right? The itinerary for this trip: Backpacking 3 nights, approximately 23 miles, 2 summits. Tip: Here is a Backpacking Gear Pack List put together by Shoestring Adventures. After getting into backpackers camp the night before, we got up in the morning, packed, and ate breakfast. We drove to Sunrise Lakes Trailhead and got a briefing from our trip leader, Graham, on how to properly pack a backpack. This way the pack would stay balanced and upright. We divided up food into bear canisters for the road. Shoestring provides and cooks all food, but with only one trip leader everyone has to carry their own weight. We started on a relatively flat trail through the tall trees and boulders, capturing glimpses of Yosemite's famous granite mountains. It smelled like pine, and the air had a hint of smokiness from the recent forest fires. There were trees all around, California black oak, ponderosa pine, incense-cedar, and white fir. After a breezy and relatively flat mile or two, we reached a point where the real incline began. There were switchbacks for a few miles at over 8,000 feet elevation. With each person carrying 30-35lbs packs, this is where the real challenge began. I started breathing more heavily, heart pounding, taking it step by step. It becomes a mental over physical mind game, at least for me. "One step at a time, you can do this," I tell myself. Everyone has their own rhythm, their own pace. We'd stop and break occasionally to make sure we all stayed together. After about 5-5.5 miles we scouted and found a great little cove to camp in for the night along Tenaya Creek. When you're guide makes you delicious camp pizzas after a long hike, nothing can taste better in that moment. We ate, we drank, and made a fire under the starry sky. We retreated to bed early. The next day would be our longest and most challenging of the weekend adventure. Tip: Bring a collapsible water bottle to use as a flask. Camp pizza night. Tip: Use tortillas as the crust! We woke up and packed our bags more quickly and with more ease than the previous day and started on our way to Cloud's Rest. It took us about 3 miles to get to the base of Cloud's Rest. From here you can look out to the vast valleys below the rocky terrain. Entire landscapes are dominated by granite, the rock composite of nearly all Yosemite's mountains. Up to the left was a steep incline of stacked rocks to the summit. As we climbed higher, there was a clear view of Half Dome in the distance to the right. We continued up the ridge to a truly breathtaking view at the summit of 9,926 feet. The mountains were so pale and expansive it felt as if I were looking at a green screen. It was majestic and calming. We removed our packs to relax for a while and take it all in (and get some amazing photos!). The view from Cloud’s Rest (elevation 9,926’). 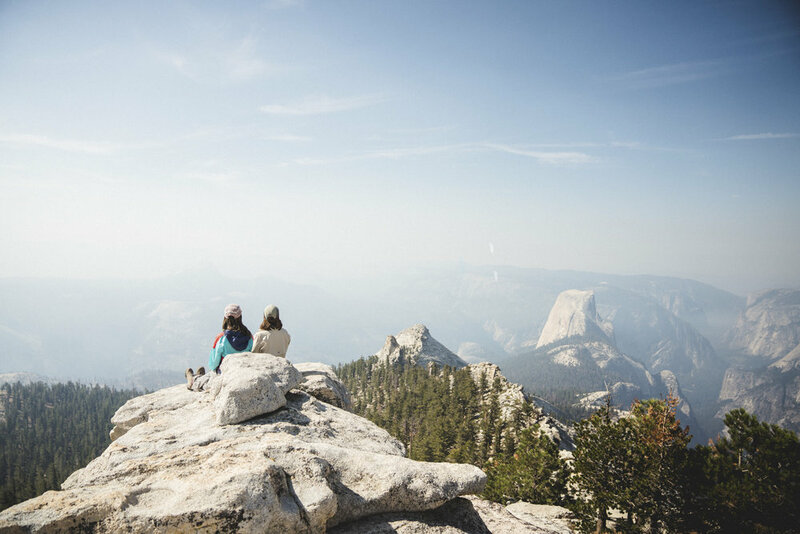 Our original itinerary had us summiting Half Dome the next morning. We changed the itinerary to climb both Cloud's Rest and Half Dome that day so that our last day we could return home and get a good night's sleep. This meant we had to hike back down into the valley then back up to the dome before nightfall. We started on our way so we could set up camp and conquer our next summit. We hiked another 3 miles to Sunrise Creek near the John Muir trail junction. This part was tough for me, downhill with a pack is harder than uphill with a pack. My back was killing me by the time we got down to set up camp. 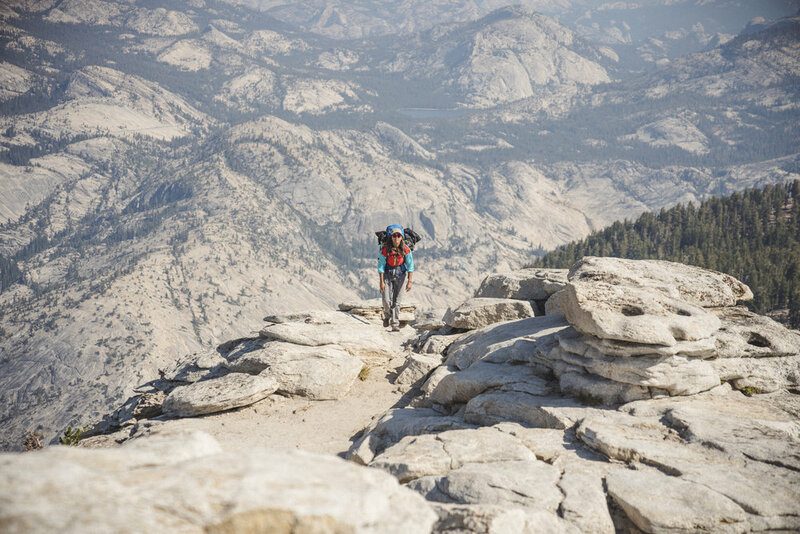 We did a quick setup, ate lunch, and grabbed our lighter day packs for the trek to summit Half Dome. I felt like I could hike a million more miles without that extra weight on my back! 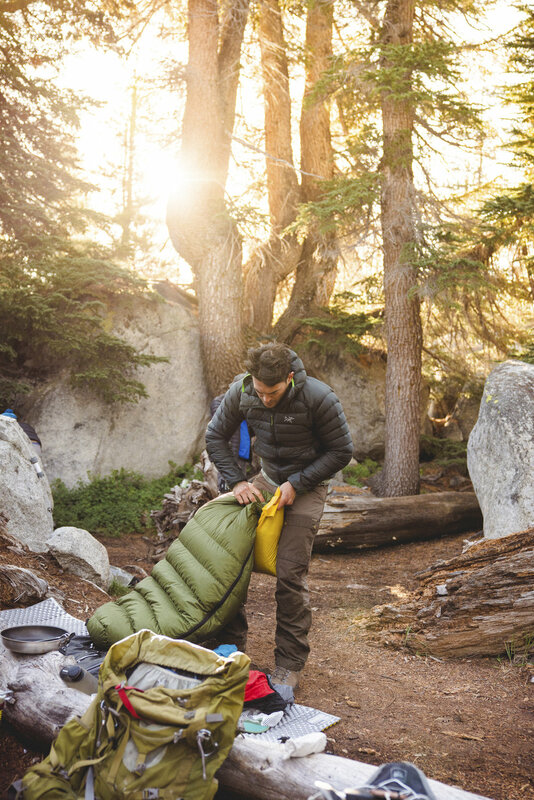 Tips: Set up camp near a fresh water source, so you can refill your water bladders. Use a filtration system to clean the water. Everyone had a new found pep in their step. This was the major milestone we had come to accomplish, and now we were on our way. It was a 2.5 mile trek to the peak. The first mile was breezy, with minimal elevation gain. Then slowly, our incline got steeper and steeper, and we had to slow down our pace to breathe through it. We passed all types of people, asking them "how was it?" And all replied, "keep going, it's amazing!" The first part of the incline was thick with trees and forestry, then we came upon the great granite steps leading to the base. They are literally granite stairs that go on and on, into the sky, a steep incline. At this point I put on my headphones to drown out the sound of my own heavy breathing. The music kept me going, it made me feel more energized as I ascended the stairs, then scrambled over rock faces, then finally reached the base of the dome. See this black specs at the top of the cables? Those are people. This was it, the platform before the cable climb to the summit of Half Dome. I had always imagined the cables were there for safety and not absolute necessity. So looking up at the near vertical climb was pretty daunting. 400 feet to the top. The thought definitely crossed my mind that this might be something I could pass on. I'm a pretty adventurous person, so for me to get butterflies in my stomach means it's pretty serious. We started heading up, and about a quarter way up I had to stop and calm my breathing because I was so nervous. One thing that was highly in our favor is we only had to pass 2 people on our way up the cables. Sometimes there is a line of people the entire way. I did NOT look back for fear of vertigo. I kept my gloved hands firmly on the cables gripping hard all 400 feet to the summit, then immediately anticipated the inevitable downward climb. 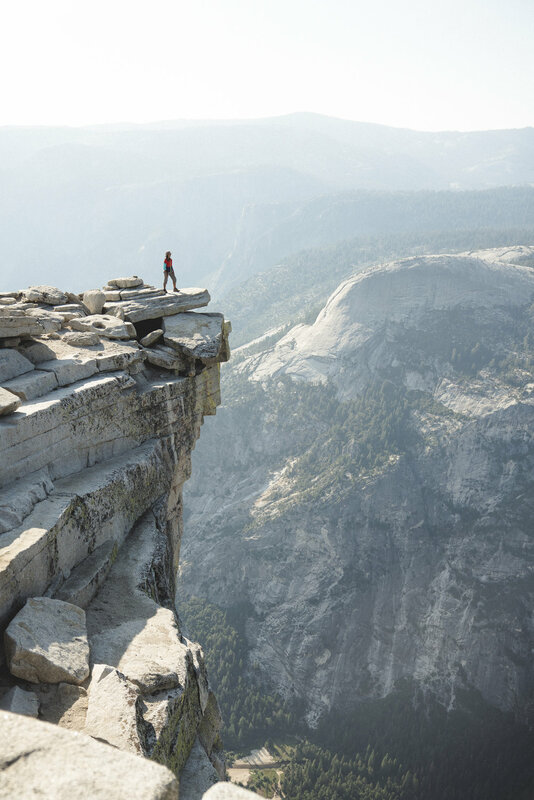 The top of Half Dome is a surprisingly large platform with plenty of room to roam. The grandeur of the views, especially nearing dusk as we were, are worth the climb. Still. Scariest thing I've ever done in my life. We saw a lot of hikers facing forward for the climb down, we opted for the reverse, which I highly recommend. Turn your back to the bottom, place your hands on the cables and creep down as if going down a ladder. You have a better grip if you slip, and you less likely to get vertigo. We headed back to camp, proud that we had accomplished our goal. We were all really surprised at how mentally challenging the peak was. Back at camp the first thing I did was kick off my boots and lay in my tent for about 15 minutes to recharge. We made delicious tacos that Sunday night around the fire, drank whiskey, and discussed our recent escapades. I slept well that night, completely depleted from an 11 mile day. We started our last day with some oatmeal and coffee to power up. It was the final day of our excursion. 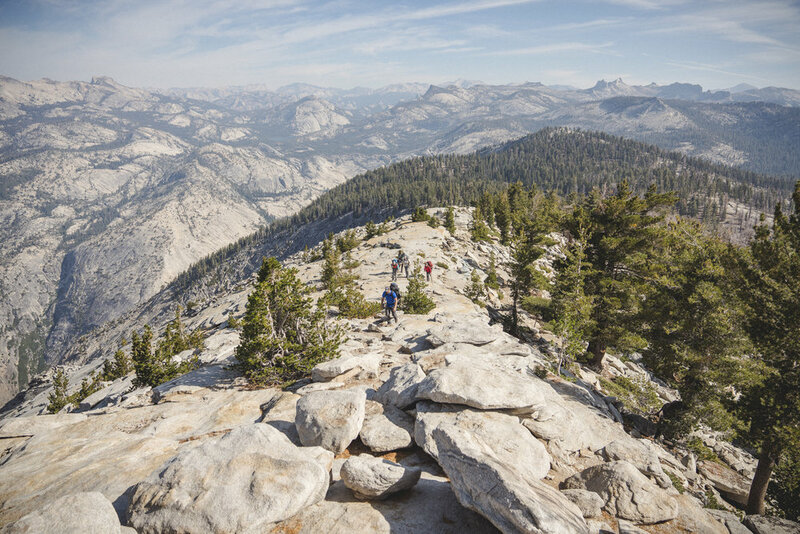 We headed down the John Muir Trail to return to Half Dome Village. The trek was mostly downhill. Highlights included a bear sighting, and the gorgeous cascading Nevada Waterfall. After 5 miles we reached civilization again. The bustling and busy Yosemite that most people experience with loads of tourists. I have to admit I felt like a badass passing by with a massive pack on. Although after 6.5 miles we reached the road and I was ecstatic to remove it, only to find out we had to walk along the road for 1 more mile to our car. We got to the car and I heaved it off my back. I took off my hiking boots and replaced them with airy sandals. It felt good to be weightless. Next stop, scarfing down some hot food on the way back to lalaland. A well earned meal! Backpacking tests your mental and physical strength. There are low moments where your body aches and your feet are sore. But then you reach a peak, or see a gorgeous lake, or pass some wildlife in its natural habitat and suddenly your spirits are lifted for those magical moments of beauty and solitude in the backcountry. Use the promo code CHRISSIHERNANDEZ to get 10% off your first Shoestring Adventures workshop or weekend trip. DesignChrissi Hernandez October 11, 2017 L.A, sofar sounds, poster design, music, the naked and famous, faarrow, magic!